The Schneider Family Book Award honours an author or illustrator for a book that embodies an artistic expression of the disability experience for child and adolescent audiences. As so many of us are trying to include more diverse titles in our classroom libraries and read aloud selections, these award winners are an important resource for teachers and parents. When Alyson Beecher from KidLit Frenzy asked if I would be willing to talk about a favourite Schneider Family Book award winner, many titles came instantly to mind. 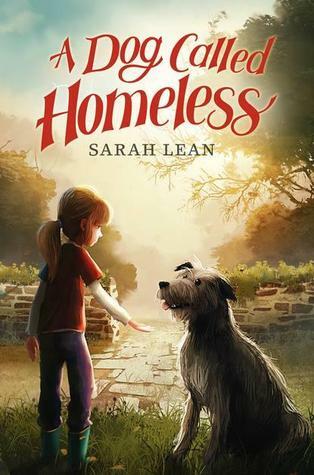 I chose to share Sarah Lean‘s touching middle grade novel A Dog Called Homeless (a 2013 winner) because this is a title that both my daughter Beatrice (now eleven) and I adored. I am also planning to read this book with my Junior Student Book Club this fall. This is a precious and poignant read – one that you can sit down and finish in one emotional sitting and then carry it with you for ages. Lean takes on a tragic topic – losing a parent and explores the complexity of carrying on. We meet Cally Fisher and experience her grief and the healing process she goes through which involves new friends, visions of her mother and a very special dog called Homeless. Cally needs to talk about her feelings and about missing her Mom but lives in a home with a brother who buries himself in his room and a father who covers himself in work and detective dramas on television and works hard to desperately avoid any memories of his wife. After Cally participates in a “sponsored silence” at school, she stops talking altogether. Without words, she begins to learn there are many ways to listen and to be heard. Sam, a new neighbour and friend who is blind and mostly deaf teaches her some of the most important lessons about communication. He gives Cally space, trust, faith and the companionship that she really needs. This book is about many things, but at its core is a relationship between daughter and mother. So I asked my daughter to help me write this post. We both reread the novel and wrote up some questions for each other to answer. I asked Bea to write three questions and she gave me ten. An incredible, thoughtful ten! Proud Mama that I am, I’ve included all of them below. We each responded to three questions posed by the other. 1. Do you think Jed is one of the most important characters in the story? Jed is the link to both Homeless and Cally’s Mom. But he is also one of the characters that helps us measure the hearts and compassion of the other characters in terms of how they interact with him and the respect that they do or don’t show him. Surprise, surprise that I identified with Sam’s Mom, Mrs. Cooper. I loved how she adored her son and was very protective but yet, she had lots of room in her heart to care about others too (like Cally). She was a fun Mom who interacted with children in a natural and encouraging way. 3. Other than her mother, what do you think Cally needed most in the story. Do you think she got it? 1. Cally’s Dad says to her midway through the book: “You know sooner or later you’re going to have to speak. How else are you going to get what you want.” What do you think about this? That wasn’t fair to Cally – her mom just died and her dad should realize that is is so hard on her and maybe he should have asked her to write stuff down rather than pressure her into it. It seems like her Dad doesn’t understand her or try to understand her. 2. All of the characters handle grief in such different ways. How do you think you would handle grief? If you died, I would always be crying. I would probably shut off from the world for a while. It makes me want to cry just thinking about it. 3. What made Sam such a good friend to Cally? I think Sam knew that Cally was going through something rough and he understood the rules of friendship and knew how to not make her sad but instead make her SHINE. He let her feel like he understood her. And he was also kind of an inspiration to Cally. He had all these disabilities but he got through it and was a better person because of it! What did you think about how Cally’s friend Mia treated Cally? Do you think Cally’s dad payed more attention to Cally when her mom was alive? Do you think it was proving something to Mia and her teacher that made Cally stop talking for longer than needed? Would you run away from Sam like Cally did? And do you think Sam felt bad when that happened? Do you think Jed is one of the most important characters in the story? What do you think was the role of Homeless in the story? Do you think that Cally’s dad should have let her keep Homeless in the beginning?What effect do you think that would have on the story? Do you think that Cally’s mother was really there as a ghost at the beginning of the story or do you think Cally just wanted her to be so badly? Other than her mother what do you think Cally needed most in the story? Do you think she got it? I found a tweet in author Sarah Lean’s twitter feed tweeted the day her Schneider award arrived in the mail. Thank you Sarah, for sharing A Dog Called Homeless with your readers! To celebrate the 10th Anniversary of the Schneider Family Book Award, readers have an opportunity to win a set of all three 2014 Schneider Family Book Award winning titles. Participants must be 13 years or older and have a US or Canadian mailing address. There will be one winner but you can enter from any of the blogs as part of this celebration. This entry was posted in Blog Tours and tagged blog tour, middle grade novels, Sarah Lean, Schneider Family Book Award by carriegelson. Bookmark the permalink. This sounds like a lovely book. You must be very proud of the questions Beatrice asked. They show the quality of discussions you have had with her about books over the years. I’m sure it’s always a treasured experience. It is a very difficult thing for a young child to think about losing a parent. Even my adult daughter doesn’t like to think about it. She would just cry too. I like that Beatrice said she would shut off from the world for a while. That’s what Cally did. Thanks for sharing. Thank you Norah. It is very special to be able to connect over stories with our children. Especially stories that are so powerful like this. Beatrice is such an avid reader, I am very proud of her thoughtful reflections and questions! Carrie – There are some incredible questions and responses here. I love what you have done. Also, I had not seen the picture of the award that Sarah posted. How cool is that. I mean I was on the stage when her editor accepted for her but still. 🙂 Thank you for this. I loved that tweet so wanted to share it 🙂 My daughter’s questions were a hard act to follow. Fun to do with her! I knew your daughter was amazing before this, but this shows the rest of the world. I love these questions. I love the asking of them. I’m contemplating book club ideas for next year on account of them. She is an inspiration, that is for sure! Thanks for supporting her reading life! I’m not surprised that your daughter can “talk” books just as well as you can, Carrie. I love the idea of your exchanging questions. I have read this book, but (oops) forgotten how much I enjoyed it when I read it. Thanks for reminding me of all the sweet parts and characters! Thank you Linda. I love that I have the love of stories in common with my children! Reading it for a second time, I loved it just as much. I wish I had known about this book sooner. Two students in my class last year lost their dad. It’s never too late though. Now I have a new book to share and I am reminded to ask for recos in the future. Love your conversation with Bea. Thank you Julianne. This is a fantastic book for so many reasons but, yes, meaningful to talk about grief and loss. A really accessible read. Thanks Mom I loved your post! Our post, my love. Thanks for doing this with me. Thank you Bea for doing this with your mom! Cheers to you! I love how you and your daughter did this post together. This book has been on my TBR list for too long. Excellent post! Thanks Gigi. When Alyson asked me about this I instantly thought of this book and of doing it with Bea as she loved it so much too! It’s not a long book – so worth reading. I loved it the first and second time I read it.